Goal scoring officially is up in the NHL over last season. Not by a whole lot, mind you, but up. According to figures obtained from longtime NHL statistician Benny Ercolani, an average of 6.2 goals per game was scored (both teams combined) through the first 164 games of the 2018-19 season, as of Monday. That is up from the 6.1 of last season, through the same number of games. Scoring may not be up too much from last season, but from other recent years, it sure is. Through the same 164 games in 2016-17, the average was 5.6. The three years before that, it was 5.6, 5.4 and 5.4, respectively. So, when it comes to NHL betting, take the over for NHL games these days, right? Wrong. Going into Monday night's games, 20 of the 31 NHL teams are hitting the under at least 50 percent of the time. Of the 20, 15 are hitting the under at least 54.5 percent of the time. 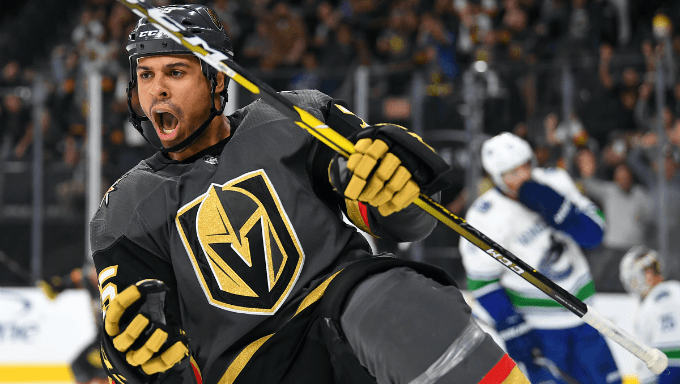 One Nevada-based sportsbook manager I spoke with said NHL teams are hitting the under 55 percent of the time. What’s going on here? In short, goals are coming in small-batch big bunches -- not as evenly spread out on a consistent basis. Let’s take a deeper look. Let’s take the Colorado Avalanche, for example. They entered Monday tied with Chicago for most goals in the Western Conference (41 through 12 games, 3.4 average), are hitting the under 58 percent of the time. That’s partially because the Avalanche has scored in bunches, with 22 of the 41 goals coming in just four games. It’s also partially because the Avs have allowed only 27 goals so far, with very strong goaltending. Otherwise, the Avs have been shut out once and limited to two or fewer goals in four other games. The Avalanche is going to continue to be prone to hitting the under, in my opinion, because they are mostly a one-line team. Once you get past the dynamic trio of Nathan MacKinnon, Gabe Landeskog and Mikko Rantanen, the pickings get a lot slimmer as to players that can be counted upon to score consistently. Currently, the Avs also are without two key young forwards (J.T. Compher and Tyson Jost) because of concussions, with no firm timetable on a return. The Avs also have gotten just two goals from defensemen so far. So, until further notice, continue to take the under on Colorado at 888Sport -- even though the Avs can really score at times. Let’s take a look at another team that has scored at a pretty good clip so far, but, like the Avs, is hitting the under with more frequency. Only 12 other teams have scored more than the Boston Bruins’ 34 goals so far, through 11 games (3.1 average). Yet, the Bruins are hitting the under 63.6 percent of the time. Like the Avs, the Bruins get the majority of their scoring from just one line - the terrific trio of Patrice Bergeron, Brad Marchand and David Pastrnak. Of Boston’s 34 goals, 14 came in just two games. Otherwise, the Bs have been shut out twice and held to two goals or fewer in three other games. Boston has allowed only 27 goals so far, with a deep defense and strong goaltending. You have to really pay attention to who Boston is playing that night, in betting the over-under. In the two games in which the Bruins scored 14 goals, one was against the dreadful Detroit Red Wings (eight goals) and the other against the expected-to-be-a-lottery-team Ottawa Senators. Against teams with either a real good defense or goaltender or both, Boston has struggled. The Carolina Hurricanes are another team scoring at a healthy 3.1 per game average, but just like Boston are hitting the under 63.6 percent of the time. The Winnipeg Jets are hitting the under 70 percent of the time so far, averaging 2.9 goals per. Look for that percentage to go down, as the Jets have a better-balanced offense than they’ve shown so far. Until then, look to play the under on them at Karamba. The Ottawa Senators lead the league in hitting the over, at 77.8 percent of the time. Ottawa scored 35 goals in its first 10 games, and has had good consistency throughout. Ottawa has scored three or more goals in nine of the 10 games. Despite pundits who said the Sens would be brutal in all areas, so far they have gotten balanced scoring throughout the lineup. The Philadelphia Flyers have scored 2.9 goals per game on average through their first 11 contests, but rank second to the Senators in hitting the over, at 72.7 percent. Philly’s 46 goals against is the most in the league, too. The Blackhawks are tied with Colorado for most goals in the West, and have allowed the most in the West (43). Yet, Chicago is hitting the over at a relatively modest 58.3 percent of the time, because it, too, has tended to score in bunches, then go cold. Bottom line: Over-under bets should always be made on a very selective basis.